There are two great oceans that humankind has yet to explore: the deep blue restless oceans here on Earth, and the ever more expansive oceans of space. Thinking it’s unlikely that there may be a planet hidden in our Solar System isn’t so unbelievable when you consider that the great majority of our own planet is still a mystery to us and that there are creatures swimming in our waters that we have no idea exist. And the great dark plains of space? Well, they’re even better at keeping secrets, even if it is in our own Solar System. Planet Nine, or Planet X as it’s sometimes called, is a planet suspected to be affecting the orbits of a group of Trans-Neptunal Objects (TNOs) out in the Kuiper Belt — a disk that stretches beyond Neptune and contains rocky, icy bodies left over from the formation of the Solar System. Pluto is one of the largest and most massive TNOs, though it’s still only a fraction of the size of the moon. The affected TNO’s are spatially clustered and follow highly elliptical paths whereas most other objects follow nearly circular paths around the sun. This isn’t caused by interaction with the eight known planets nor is it likely to be a product of chance (in fact, the odds of this being a random occurrence are less than .1%). This graphic shows the path of Planet Nine in orange while the Kuiper Belt objects travel in the plane and perpendicular to the plane of the supposed super-Earth. Image by Caltech/R. Hurt (IPAC). Planet Nine is an attractive solution for many reasons. Not only would it explain the orbits of these objects, but it would also make more sense statistically. The most common size for planets observed in the universe is a super-Earth — planets with a mass higher than Earth but less than Neptune or Uranus. While we don’t have any in our own Solar System, Planet Nine is suspected to be about 10 times the mass of Earth and traveling along an exceptionally wide orbit that extends 20 times larger than the orbit of Neptune. This means that to make one orbit, the hypothetical planet would take an astounding 10,000–20,000 years. Our best chances of observing it rely on it being in the part of its orbit closest to the sun. If it’s in a farther part of its orbit, say beyond 1,000 AU (one AU is the distance from the Earth to the Sun or about 93 million miles), it becomes a huge obstacle to detect. This is because at that point it would be over a million times dimmer to our telescopes. In his newest article, aerospace engineer and good friend Brandon Weigel runs the exact numbers on how difficult it would be to discover the elusive planet. But while some scientists argue the existence of another planet at as high as 90%, studies like the one by the American University in Beirut and Cambridge attempt to show that no such planet is necessary. Instead, it could be a disk of icy material influencing the TNOs. In certain identified mass ranges and shapes, scattered small objects could have the collective gravity needed to create the highly elliptical orbits. It’s a phenomenon that’s been observed in other solar systems where icy material at their edges can cause the strange orbits of other objects therein. The theory also has a mathematical model behind it and successfully takes into account all other eight planets of the Solar System. However, like Planet Nine, this disk has not yet been observed despite it being easier to detect than a faint planet. The model also requires 10 times more icy objects to exist beyond Neptune than what scientists estimate there actually is. Astronomer Mike Brown says that it is unlikely for a disk like the one proposed to exist for billions of years within our Solar System. 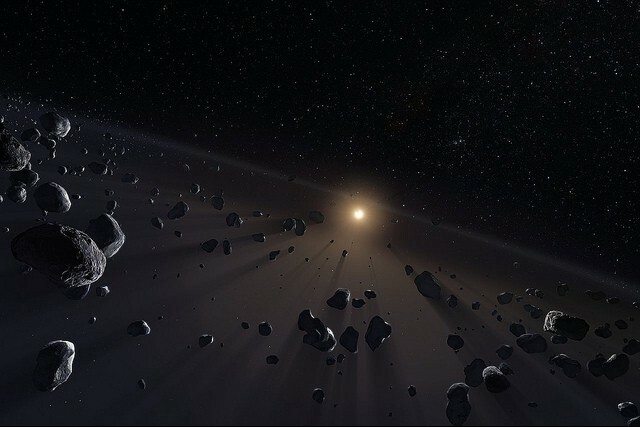 Subaru is the same telescope which helped find Farout, the most distant object in our Solar System. 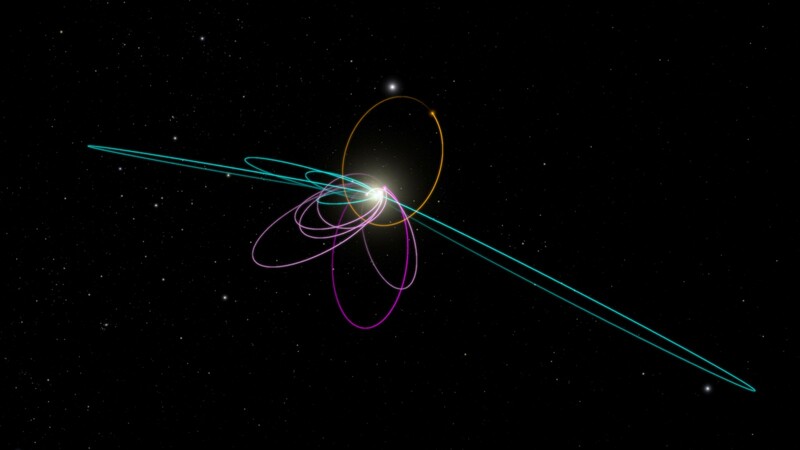 It’s the first object we’ve seen orbiting beyond 100 AU (9 billion miles) and further studying its path over the years will help see if it’s supporting evidence for Planet Nine. Farout (2018 VG18) can be seen moving in the center. Image by Scott S. Sheppard/David Tholen. Of the regions of the sky where Planet Nine is most likely to be found, only about 25% has been searched and usually not to the depth required to find an object that dim. Even the Hubble Space Telescope has too narrow a field of view to provide much help in the search. But there’s still hope. The Subaru telescope in Hawaii has both a wider field of view and is one of the largest telescopes in the world, giving researchers the ability to observe areas the size of 4,000 moons. If that doesn’t help, by the 2020’s the Large Synoptic Survey Telescope will be operational from its place in the Chilean Andes. Built to study such mysteries as dark matter and dark energy, the telescope will survey a huge area of the sky and compile a thorough amount of data and images on the astronomical objects. Proxima b was also a challenge to find though it’s the closest exoplanet to Earth, orbiting our neighboring star Proxima Centauri. Both are quite small and it took nearly a decade to detect the exoplanet using movements in its parent star. Our current technology was just barely able to detect it. And while research teams in the search for Planet Nine have a week of viewing time each year, weather obstructions have been making it even more difficult to plan an in-depth search. Projects like the Next Generation CMB Experiment will be the biggest players in determining whether or not the mystery planet exists. Even at the 1,000 AU limit mentioned earlier, the dedicated telescopes and their highly sensitive cameras would be able to pick up a planet with 10 times less mass than that of Planet Nine. It is possible that both Planet Nine and and an icy disk like the one pictured here are responsible for the orbits of the Kuiper Belt objects. Image by European Southern Observatory / M. Kornmesser. When we see the new discoveries of far away exoplanets or the detailed pictures of our own gas giants, it can be easy to forget that we don’t yet have a clear and detailed image of space. We can study shores and barrier reefs at our most beautiful beaches but that doesn’t mean that the rest of the ocean is not still an ongoing mystery. And whether the medium is cold, dark water or the vacuum of the universe, there are still many places our technology hasn’t mapped. Many places possibly harboring new worlds. This article was a collaboration with Medium writer and engineer Brandon Weigel. Please read his article here where he gives a detailed and fascinating overview of the difficulty of searching for a new planet.